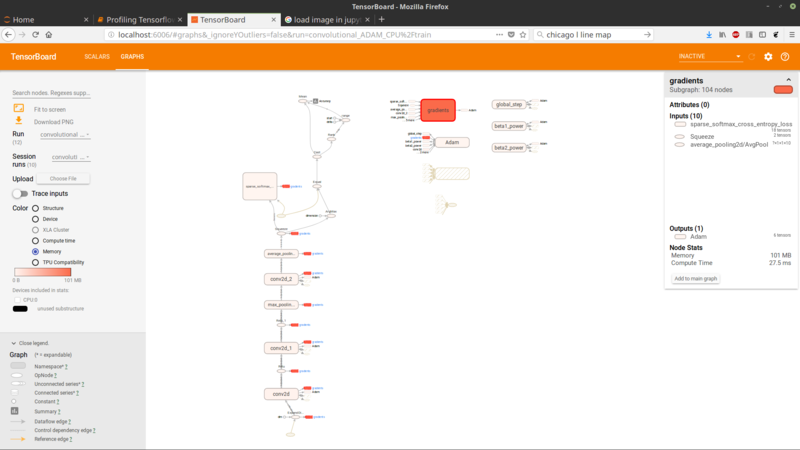 This blog post is meant to surve as a basic tutorial for how to profile tensorflow. I'll use several different networks for a basic classification task, and compare CPU vs. GPU performance with profiling tools. By the way, this tutorial has networks trained by using singularity to pull in all the products I need. There was just recently another blog post about singularity, check it out! As a baseline network, let's build a fully connected classifier with 2 hidden layers. As a more advanced network, we can use a convolutional neural network with several layers. As a comparison, we will use the fully connected classifier with many less neurons in the hidden layer. # I am hard coding all the parameters here, since this is just about profiling. 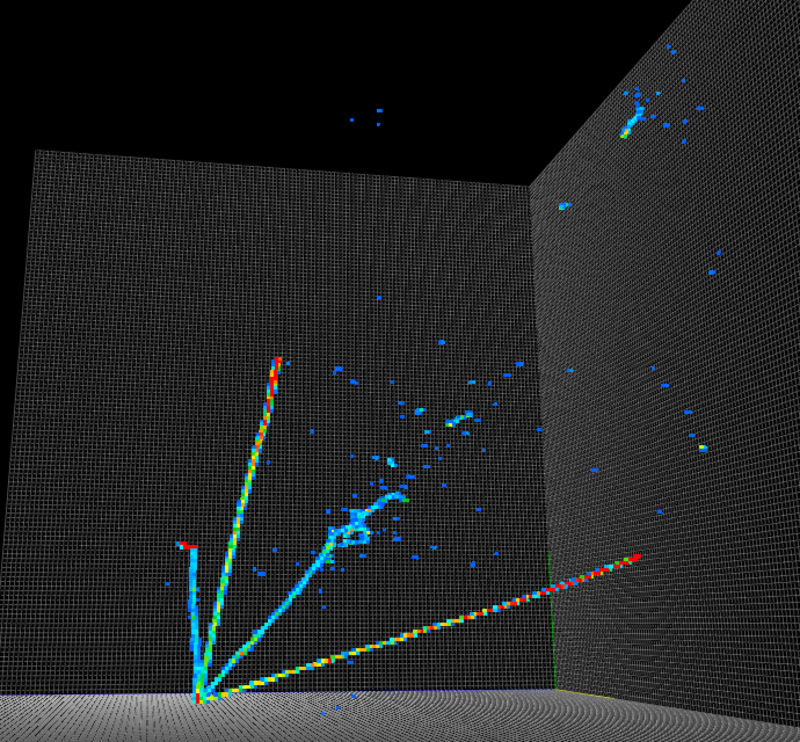 Set up a full model with input, optimizer, etc. This is a good bit of code to put in one cell, but it's meant to be run multiple times with different parameters. # Here we can set up an optimizer for training the different models, and we will use profiling as well. # This configuration will allow us see the GPU usage with nvidia-smi. That is, it won't hog the whole GPU. # Allow the full trace to be stored at run time. # then perform that number of steps. 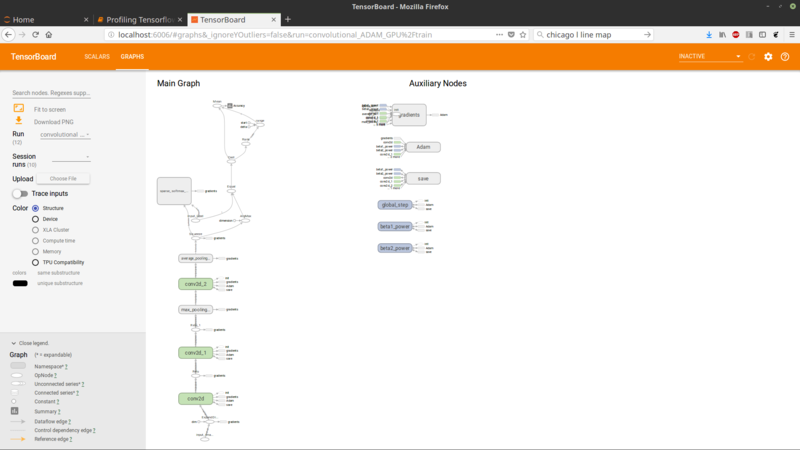 Other important pieces: allow_soft_placement will let tensorflow pick the best place for an operation, and log_device_placement (if changed to true) will print out the location of every operation. Setting config.gpu_options.allow_growth = True let's the used memory of the GPU only grow as needed, instead of claiming the whole GPU. Note the frest instance of run_metadata, which gets passed to the session.run call along with the run_options from above. The meta data gets added to the log with a seperate call to the writer than the summary: writer.add_run_metadata, which requires a name and a step. Probably this takes a little time to run. For me, as you can see, it took awhile. There are three parts to this comparison that I'll go through. One is based on comparing the metrics from above, which are based on timestamps in execution. 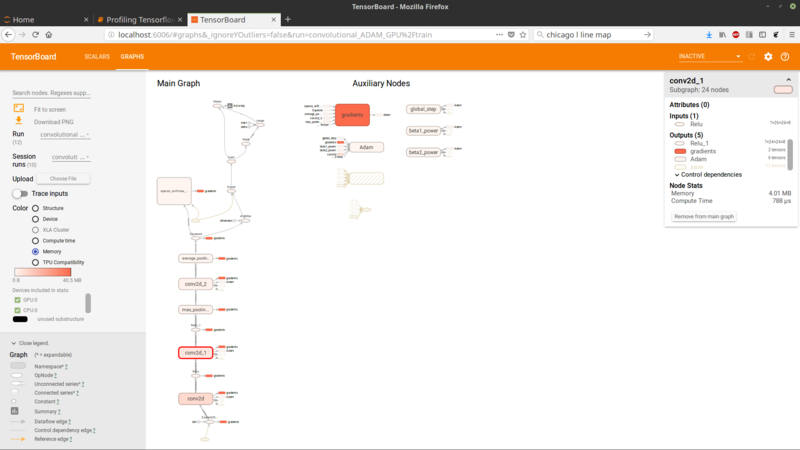 The second is to look at tensorboard, which I'll show below. The last is comparisons based on chrome tracing, which requires the chrome browser, but can still provide interesting views. So, here's an interesting result already: The smallest network trains fastest of all the networks, (which is not surprising), but the CPU implementation is beating the GPU implementation for performance! We'll look into why that's happening next. In all cases, after 10 epochs Adam is outperforming SGD on the testing set. There is some indication that this is not true for very extended training (Adam and other adaptive training methods have a larger gap between train and test than SGD, according to some experiments), but on the other hand these results are not really good yet anyways. 90% accuracy on this training set is not particularly excellent, but that's not the point of the tutorial anyways. As we see, the CPU implementation took much longer for the two operations shown here. From these comparisons, you can see that the conv2d operations are running much faster on the GPU than the CPU (note the difference in scales) and further, all the time consuming operations on the GPU are much faster. Those small operations towards the beginning are copying data to the GPU, after which there is a bit of a pause. Then, the GPU does compute operations much faster, but the CPU has enough of a headstart that it completes the training slightly ahead of the GPU. With a bigger network, the GPU should start to win this race more easily. Note that the time scale for the GPU is about 7.5 ms, while for the CPU it's more like 17ms. The GPU spends most of it's time doing a memory copy, but then the inference pass is extremely quick compared to the CPU, and the final inference result is delivered in half the time. In this blog post, we looked at how to compare run times and memory usage of different network architectures. There were three main techniques used. First, we used simple python time.time() calls to measure time stamps before and after key events (training iterations, epoch calculations, etc). This gave a good indication of the total time spent training. 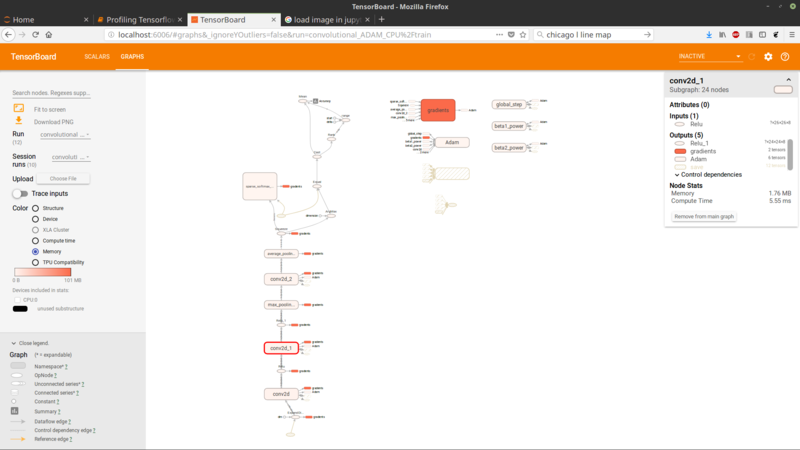 Second, we look looked at tensorboard output which showed us both time per operation as well as memory usage per operation. This is a good way to spot bottle necks and memory hogging operations. Last, we compared the traces in chrome://tracing to see the sequential order of operations, how they were distributed across CPU and GPU cores, and what operations took the longest. This let us see why the CPU version of the lighter fully conencted neural network was training faster than the GPU version. If you run this notebook yourself, it will generate all of the tools you need to look at these results yourself. You will get tensorboard output and chrome traces saved. I encourage you to try it, and as well to modify the networks and see how the memory and compute time performance changes.